For those of you who have a tendency to forget, Google is not really a web services company, or a mobile platform company, or even a search company. No, Google is an advertising company which uses the revenue from ad placement to fund almost all of its other endeavors. 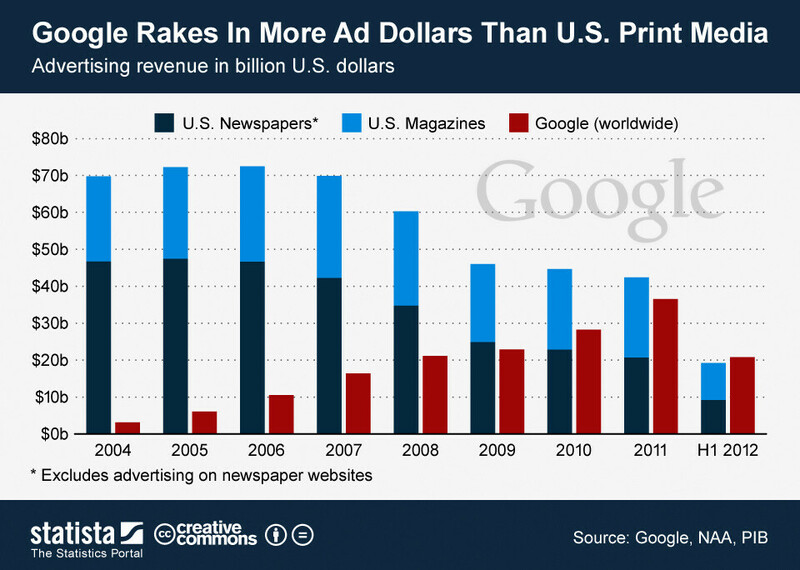 Now, Google can say that it generates more in ad revenue than all American print media combined. This day has been coming for some time now as print media has been on the decline, and shifting towards the Interwebs. And, once you get onto the Interwebs, well, that's Google's territory. According to numbers from Statista, in the first six months of 2012, Google earned in $10.9 billion in ad revenue, while all American print media (newspapers and magazines) pulled in just $10.5 billion from print advertising (the numbers don't count ads on newspaper websites). As you can see in the chart to the right, this day has been coming for a while. Of course, the numbers aren't exactly an apples-to-apples comparison, because Google's ad revenue is for all of the ads the company runs around the world. So, a more accurate statement is that Google generates more ad revenue globally than the US print media generates domestically. Still, given print media's trajectory, it's not hard to imagine Google one day making more than print media in direct comparison. But, by then it'll probably be better to start comparing news website ads vs Google ads. No wonder they're becoming more famous and richer than Apple! 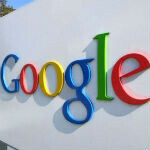 In a strange way, Google is a .com company that actually works. If you look carefully, magazines aren't growing, but neither are they really shrinking. That makes sense in a weird way, they can do things that a blog will have trouble with, and they have been better about adapting to the new digital medium. Don Draper would be proud! I remember back in the 80's where people speculated about the end of print media where in the future people will be reading everything on a screen rather than on paper. Then in the 90's what actually happened is that offices actually used even more paper than before due to computers. It is in the 00's that I noticed that my use of paper has declined. I have also let my subscriptions to magazines expire. The last two magazines that I used to subscribe to was a gaming mag that got cancelled because when the issue was available, much of the information was out of date, thanks to the internet. The other is a TV Listings magazine, partly due to finding the same or better info online or off my cable box and partly due to my watching less TV.